Homemade chocolate chip cookies are one of the easiest yet tastiest sweets to make. They satisfy almost any chocolate cookie craving. I’m always looking for ways to put a twist on classic treats or maybe just an excuse to make them more often. 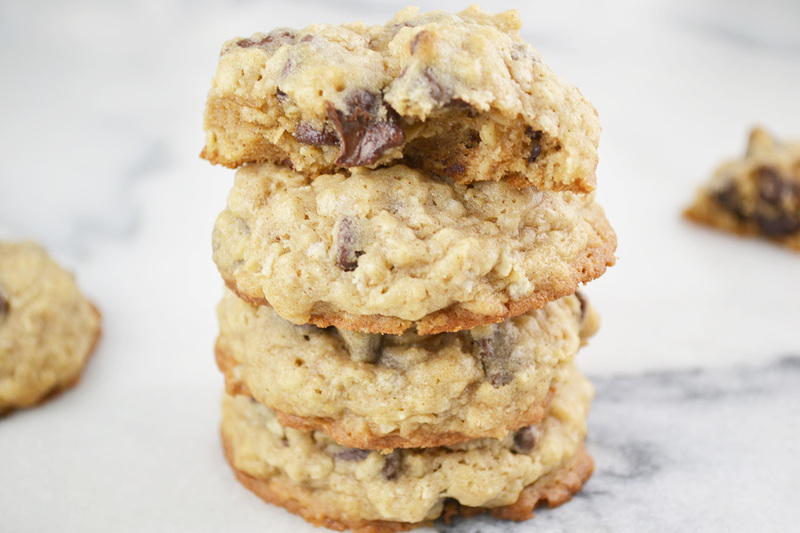 Oatmeal is one of my favorite variations of this popular go-to cookie. It adds an interesting chewy texture and makes it easier to pretend that chocolate chip cookies are good for you. Raisins and cinnamon are common and natural pairings with oatmeal, especially for a cookie. However, I find it hard to pass on chocolate in a chewy cookie. Also, raisins seem too healthy for a dessert that still contains butter and sugar. The chocolate with the chewy oatmeal and the zip from the cinnamon are worth cheating on that spring beach body diet. I created this recipe on a whim. I was making dinner for a friend and realized I had nothing planned for dessert. Since my friend is not really a “dessert person,” the dessert was really more for me than it was for him. I wanted chocolate, a cookie, and something easy that I already had all of the ingredients for. A sort of pantry dessert. Chocolate chip cookies were the clear choice and it had been a while since I had made my favorite oatmeal version. I decided to add cinnamon at the last minute when I stumbled over the jar in my cupboard. We definitely consumed more of the raw cookie dough than intended but the remainder that made into the oven, filled the kitchen with an amazing scent of butter, cinnamon, and cocoa. Few cookies made it past that night or even into these photos. The melting gooey chocolate and chewy cinnamon spiced oatmeal was just too hard to resist. Beat butter and both sugars in large bowl until creamy. Add eggs, milk and vanilla extract. Mix well. In a separate bowl, combine flour, baking soda, cinnamon and salt. Stir into wet ingredients. Mix in chocolate chips and oats. Drop dough by rounded tablespoons onto ungreased baking sheets. Bake for 9 to 10 minutes for a chewy. Cool on baking sheets for 1 minute; remove to wire rack to cool completely.